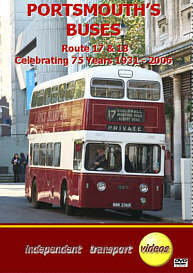 In November 2006 Portsmouth’s busiest route, the 17 and 18 circular, commemorated 75 years of continuous operation and independent transport videos were there to capture the celebrations on film. The video programme starts at the Guildhall Square on the 4th November to see a range of vehicles arriving at the Portsmouth Bus display. Our cameras exclusively witness the official opening of the celebrations by the Lord Mayor. We then take a nostalgic trip on board Leyland Titan PD2, fleet number 4 (LRV 996) on the service 17 to Eastney where we witness a meeting with sister vehicle number 2 (LRV 992), before returning to the Guildhall festivities. A ride on number 2 then follows on route 18 to Eastney returning to the Guildhall via the Hard. We then feature a ride on a 1964 Leyland Atlantean, 236 (BBK 236B) on the service 17 revisiting old haunts including the site of the former Eastney Bus Depot. At the end of the day the exhibits leave the celebrations after an enjoyable and memorable event. Courtesy of First Hampshire and Dorset Ltd., our cameras are given exclusive access to film Portsmouth Corporation liveried Volvo B10BLE, 66161 (S361 XCR) in regular service around the route. Following a behind the scenes look at 66161 being prepared for service, we join Darren Marshall on a morning's duty around route 17 sampling this busy service. We then concentrate on the present services from selected vantage points including: Bradford Junction, Albert Road, Edinburgh Road and Goldsmith Avenue as well as the route’s local landmarks. There is a Photo Gallery with a unique collection of images taken along the route from tramway operation in the 1930’s to contemporary portraits, representing the wide selection of vehicles that have operated throughout the past 75 years on the 17 and 18 circular service. Finally taking a step back in time to the 1970’s and 80’s, we are able to look at the Portsmouth fleet at work across the city during that period, courtesy of Bob Gray with his cine and early video camera. It is a great pleasure to record this milestone in the transport history of the city of Portsmouth. Duration : 112 minutes (approx).